Got an empty spot on your wall and no ideas for what could possibly go there? Here's a list of projects you could make yourself. Framed objects (try your own DIY version) by the. Wow!! 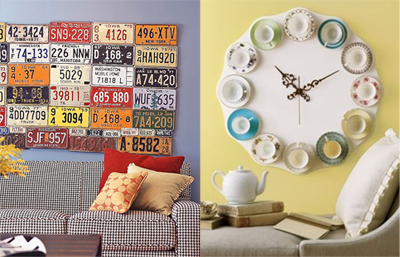 That teacup clock is totally amazing! gee whiz, most of those look like things I'd love to do... I've been trying to figure out what to do in our bedroom for the longest time. It may be time to experiment. Well, do I have plenty of empty spots on my walls..... Maybe you should make some of those for me? since we're renovating our basement i can decorate it however i want!! i've starred this in my google reader for when the time comes to decorate! thanks soo much for sharing! btw, for the license plate wall i've seen it where they have the plates in size and position on a US map, thought that was cool! The dominoes are my fav! Thanks for including us in your round up! So many great, affordable ideas. We love it (and your blog). Love the ideas! Thanks for gathering! In the process of nesting npw and these will come in handy. all great ideas esp. the teacup clock! incredible! I feel beautiful, I love the mixture of colors. To see if I can do something similar in my house and published it. wow i am looking for some greaat low-cost ideas for a couple of walls. What a great post and I love the ideas. Now what shall i make??? WOW some great ideas to be getting in with!! I like the tea cup wall piece very much! My mom would love that too! WOW! That is a great post! My brain is in *holy-cow-I-need-to-make-something-now-mode*. My toddler loves her teaset - that clock would be great for her. Except she'll try to "drink" out of each cup, and that could be an issue. But I love the silhouettes from Time Out New York. So dynamic, so full of life! This is fabulous! I am always looking for good DIY wall decor since the stuff you buy from the store is beyond crazy expensive. Thanks so much! The license plate one is pretty cool! You must've saw my apartment's massive blank back wall...but now it won't be blank for long! Thanks for all these ideas! Those are great. I love that twig mirror idea. I bookmarked that for sure! I'll be keeping my eye out for a mirror to do that with. Oh! Thanks for the links!! I appreciate the list-- I actually saw that Guardian article about the painted frames, and I bought a bunch of cheapo frames and did that project myself one rainy weekend. It turned out wonderfully if I do say so myself! Love these! I have a wall of Playbills from Broadway shows. It looks great and is a real conversation starter.